I stayed with the Shuar, a tribe in the Amazon jungle that’s known for their fierce warriors and head shrinking practices, with a bush tribe in Malawi, Africa, and have learned from other indigenous teachers around the world. In my 20+ years as a consultant with business and non-profit leaders, it’s become clearer and clearer that cutting-edge leadership best practices are well leveraged by the enduring wisdom of the indigenous mind. Like us, tribes recognize their warriors as leaders. Unlike us, they cultivate their warriors holistically. Most actual warriors were and are men but the warrior archetype depicts whole person leadership. The warrior archetype has nothing to do with gender, although, it’s a leadership style usually more readily embraced by women than men. The ancient warrior archetype embodies a distinct equanimity between doing and being. 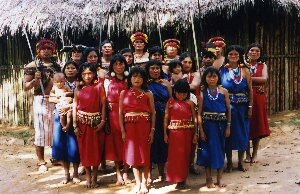 Even though the headhunting Shuar are known as some of the fiercest fighters on earth, they do not engage in gratuitous violence because their warrior ways are not unlike the Japanese Samurai who left their swords at the tea house door so they could master delicate tea ceremony gestures, which were part of the 64 Arts of standard Samurai training. Other Arts included meditation, calligraphy, painting, music, dance, and love-making. The warrior archetype distinguishes between a fighter and a warrior. A fighter wants to win at any cost while a warrior understands a fuller doing/being spectrum of engagement. Even though the Samurai are famous for what they did as fighters, the development of their being rarely makes it into translations. Same with the Shuar whose battles are legendary but who spend 90% of their time enjoying family, being free to do what they want, and, especially important to them, laughing. Given the extraordinary range of studies from around the world that are confirming whole person leadership, the noble warrior archetype of the Shuar and the Samurai has plenty to offer to the executive warrior. Current leadership mythology still revolves around fighter-oriented beliefs that allow profits to prevail over principles despite that fact that the data couldn’t be clearer: higher principles yield higher profits and compromised principles hurt organizations and their leaders. The difference between a warrior and a fighter is that the warrior understands that force without wisdom ultimately equals trouble. Indigenous culture tends toward valuing full spectrum human being-ness. Shuar warriors aren’t focused on fighting, they dedicate their lives to all tribe members being safe, fed, warm, connected to family and community, and to making sure the tribe preserves its markedly high value for joyfulness. Their valuation for deep connections to land and one another creates a high integrity culture — there is no stealing and Shuar culture is structured such that it can’t sustain concepts of why or how group members would lie to each other. Imagine your organizational culture being hardwired for integrity! Given that none of a Shuar warrior’s personal bandwidth is spent on managing aggressiveness like lying, cheating and stealing, he can invest in mastery — not just of fighting techniques, but mastery of the world within and around him. On the other hand, the executive warrior often feels forced into positions that compromise mental and spiritual wellbeing for the sake of doing something for short term gain. The Shuar benchmark is for all to thrive whereas organizational leaders often get stuck in a survival mentality with limited range for new possibilities for a better future. The Samurai and the Shuar come from cultures that couldn’t be more different but the warrior archetype transcends differences in its valuation of honor, effectiveness, consideration, respect, whole personhood, and peaceful resolution. Both understood that their warriors are not just fighters but rather masters of reaching holistic resolution and of knowing when to charge forward and when to stop. Many of today’s leaders are faced with having to unlearn much of what they’ve been taught about profiting at any cost so they can discover deeper truths about mastering success. Want to capitalize on what indigenous wisdom holds for your leadership situation? Walk the warrior’s path of developing personal equanimity by taking time for deep diving and for cultivating a fully faceted self. Follow the way of the warrior, who never fights against the inevitability of change, but rather masters the personal and cultural transformation required to negotiate it successfully.